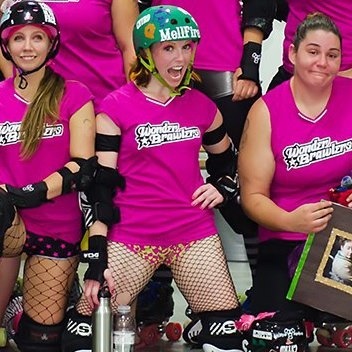 I'm MellFire from Central New York Roller Derby, I have been playing roller derby since 2008. I love it. I cannot live without it. I'm currently on a break from derby and I am not pleased about it. My league is struggling to find a winter practice space. Our previous home burned down in March of 2012 and our spring/summer home is a hockey arena. As soon as we move out, the ice goes down. To fill the void that derby practice has left, I have been lifting weights, trying a few different cardio options, and hitting as many open skates as I can. Open skate isn't easy, as most skating rinks are 40 minutes to 2 hours away from me. 2. Crush most of the cookies and the graham crackers. (You may have a handful of the cookies left to snack on while you bake.) Mix cookies and graham crackers with melted butter and 2 tbsp sugar. Press into a 8- or 9-inch springform pan. Set aside. 3. Beat cream cheese and sugar with an electric mixer at a medium speed until blended. Add sour cream and peanut butter; mix well. Add eggs, one at a time, mixing on low speed. After it is well blended, get ready to pour over crust. 4. Arrange a layer of peanut butter cups whole or chopped on the crust before adding filling, then smooth filling. Add more peanut butter cups, push them into the filling, fill in holes with filling, and smooth filling. 5. Bake 50-60 minutes or until center is almost set. 6. When cheesecake is done, open oven, turn off oven, and cool both the oven and cheesecake for 30 minutes together. 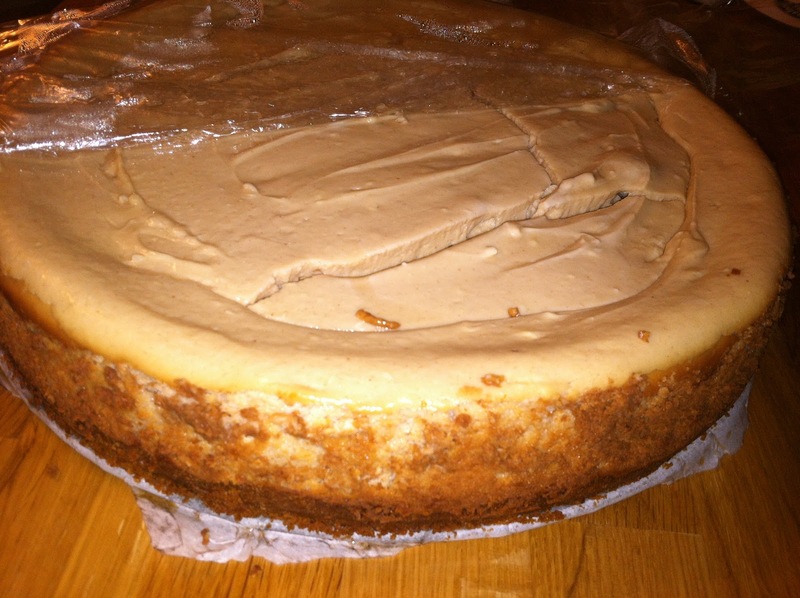 Run knife or metal spatula around the side of the pan to loosen cheesecake. Cool before removing side of the pan. Refrigerate 4 hours or overnight. Keep refrigerated. You can cover the bottom of the pan with parchment paper if you wish. I did this, it make serving the cheesecake pretty easy. Also, warm the knife and wipe the blade to make clean cuts for a nice presentation. Contact MellFire on Twitter @mellokittie or www.facebook.com/mellfire.